This Skillet Sausage and Rice is a fast and delicious dinner recipe for busy nights. A few ingredients cook up fast in one skillet with easy clean-up! This skillet sausage and rice is a fast and delicious recipe for busy nights. I love how easy this recipe is to throw together and it cooks up so fast, all in one skillet making clean up a breeze as well. Not to mention it is so tasty! My husband took all the leftovers to work and requested it for dinner again the next week. My kids loved it too. All around this was a great win for a good family pleasing dinner. A special thanks to Paige for sharing this recipe with us, it was a favorite recipe of theirs, and is now a favorite of ours too! I have a feeling that this will be on regular rotation around here. If you are wanting to add more veggies for even more color and flavor, some great additions could be onions, peppers, tomatoes, or zucchini. We used white rice, but brown rice would also work great. Also, we made it once with canned corn and once with frozen corn- both work fine, but I actually preferred the canned corn (drained). The frozen corn, while cooking, ended up a little wet when it thawed, and gave the whole dish a little too much corn flavor. The main source of flavor comes from the Kielbasa sausage, so it just needs a little bit of seasoning and you are good to go. Sauté the sausage in a large skillet over medium-high heat till brown, add in the minced garlic and stir another minute. 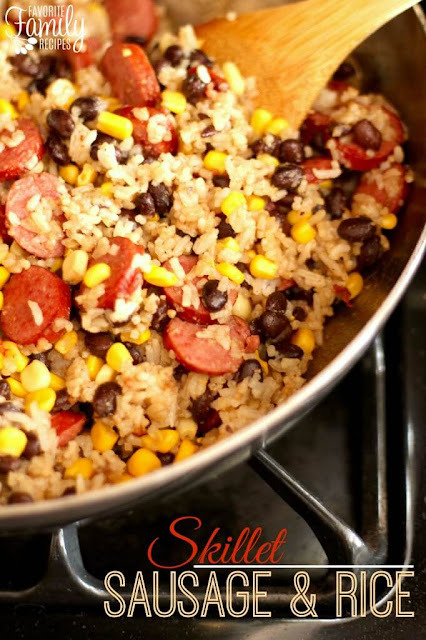 Lower the heat to a medium-low and add the drained black beans, corn, and rice to the sausage. Season with Worcestershire sauce and salt and pepper. Once everything is heated through, it is ready to serve. 0 Response to "Skillet Sausage and Rice "